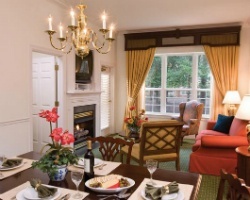 Step back in time to Colonial Williamsburg with a timeshare at Marriott's Manor Club at Ford's Colony. Browse timeshare resales and rentals priced up to 70% lower than retail today. Surrounded by meticulously-crafted gardens and buildings that call back to an earlier, simpler time, the Marriott Manor Club at Ford's Colony provides a truly unique vacation experience. Nestled in the heart of a vacation destination packed with history, scenic beauty, and exciting attractions, your home at the Manor Club will welcome you to a relaxing vacation unlike any other. 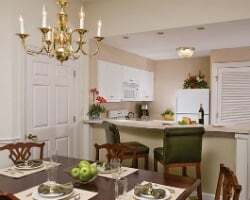 Just minutes from attractions like Colonial Williamsburg and Busch Gardens, you'll be able to explore all Virginia has to offer from the confines of the Manor Club at Ford's Colony. 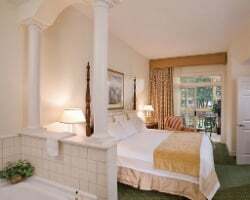 The Marriott Manor Club consists of luxurious studios, one bedroom, and two bedroom villas that incorporate modern furnishings with a classic, colonial touch to make you feel as if you've arrived at your own private estate. The resort's well-appointed suites contain desirable in-unit amenities like flat screen TVs, gas fireplaces, whirlpool-style tubs, fully-equipped kitchens, and more to ensure you feel right at home. Are you ready to lock down your very own accommodations at the Marriott Ford Colony? Fill out the form on this page to learn more, or call a representative at 1-877-815-4227 today. Buying a timeshare resale at the Marriott Manor Club Williamsburg can enable you to obtain years of great vacations and special perks for thousands less than what others pay. Unlike traditional timeshares sold by a resort, timeshare resales are sold by individual owners. This often results in much lower prices for the same accommodations, offering you the deal of a lifetime. You can get your very own timeshare at the Manor Club for prices up to 70% lower than retail costs, allowing you to save money while unlocking amazing vacation potential. Timeshare resales at the Manor Club often come in the form of deeded fixed and floating weeks, giving you a great deal of variety in choosing an ownership interval that works best for you. Manor Club timeshares fall within Marriott's Silver, Gold, and Platinum seasons, offering a number of different price points for you to consider when making a purchase. Your timeshare resale at the resort could also open up more vacation benefits through the Marriott Vacation Club. The Manor Club at Ford's Colony is affiliated with Marriott Vacation Club (MVC), one of the world's most popular timeshare brands. With a Manor Club timeshare resale, you can start making reservations at the resort immediately, but further perks and exclusive privileges can be yours if you upgrade within the club. Upgrading to Marriott Vacation Club Destinations points, for example, can lead to a more flexible method of planning vacations to Williamsburg. Additionally, points will allow you to book reservations at other Marriott resorts around the globe, opening up the possibility for greater travel experiences as an MVC member. The Marriott Manor Club at Ford's Colony is an Interval International affiliated resort, meaning you can exchange your timeshare resale accommodations in Williamsburg for the opportunity to travel the world. With a separate Interval membership, you can deposit your accommodations into their exchange network and trade for stays at comparable resorts worldwide. The Manor Club is an Elite-rated resort with Interval, meaning when you seek a timeshare exchange, you'll likely be paired with resorts of similar excellent quality and standards. This luxurious Marriott resort features a wide spread of amenities and services geared toward making your vacation experience one to remember. The resort's variety of swimming areas leaves little to be desired, with an indoor pool, two seasonal outdoor pools, and a whirlpool spa. Golfers will relish the chance to tee off at the Ford's Colony Country Club, which provides days full of exciting golf along the pleasant countryside. The on-site fitness center is available for active guests, as are the biking trails and tennis courts around the resort grounds. Don't miss the Manor Club's restaurant, Bistro 1699, which offers delicious burgers, paninis, and a selection of local craft beers and wines from Williamsburg Winery. Around the Williamsburg area, you'll find a surprising amount of things to do and see. Just minutes from the resort, the Colonial Williamsburg features museums and interactive attractions that will appeal to history buffs. Busch Gardens theme park is just a short drive away, and is the perfect spot for families to find a day filled with fun. Other attractions, like the Jamestown Settlement and Water Country USA are popular sites that will complete your Williamsburg adventure. Already Own at Marriott's Manor Club at Ford's Colony?